Aikatsu! – 116 | Mezashite! This episode helped me through a rainy and dreary day last week. Fortunately the weather is bad again, so nice timing on our part. Oozora means sky, by the way. In the episode Juri says “de dana”, but Eto thinks that she meant “de nada”. Hinaki helps us out anyway though, so it doesn’t matter too much. None of the girls in aikatsu are lesbians. I think you just want to think they are. So for you they are. Saying “none” may not be accurate. There is no evidence to support a statement of “none”. Some may be, and some may not be. The series will one day end and it probably will not be any clear then than it is now. 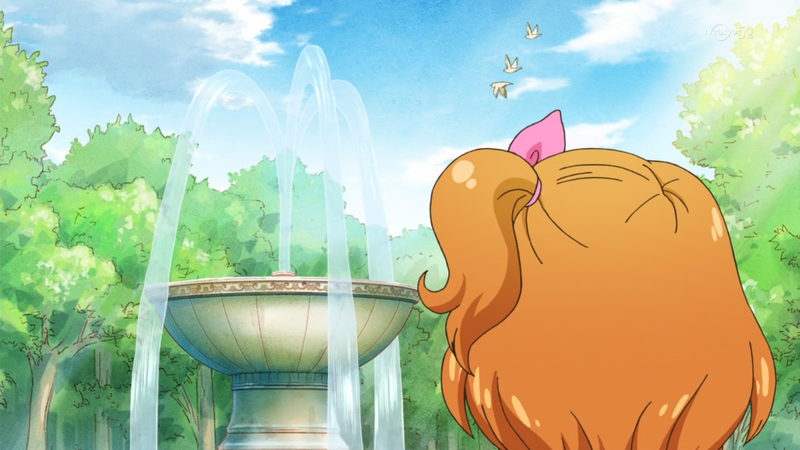 None of the girls in aikatsu are straight. I think you just want to think they are. So for you they are. Es de nada. Dana no es una palabra española. Akari can certainly brighten up even the most dreary of days. By the way, did anyone notice early in Akari-chan’s dance, she kicked “water” up on the “camera” lens? Nice touch. Etoce is correct. I know it sounds like “De dana” but dana is not even a word in Spanish. The thing is that even the closed captions say “dana” (well, ダーナ), so it’s more like the script writer screwed up and no one downstream caught the mistake because there are like ten people in Japan who speak Spanish. We could fix the mistake, but you could also argue that the faithful thing to do as translators is to keep things as close as possible to original, including mistakes. I agree with your writing it as Juri-chan actually said and not fixing it. I just assume that Juri-chan’s Spanish isn’t 100% perfect. That’s normal for many people and their native languages. But yeah, eventually it comes down to the writers. It’s been so long since I last commented here guess torrent feeds make me too lazy to here just to comment. I kinda miss the older characters since mostly only Ichigo, Aoi and Ran show up the same way Mizuki used too while Yurika and Otome show up twice only, I miss them specially Yurika. Anyway thanks for the episode.